A recent showcase of homes event in the southwestern Unites States had contractors and homeowners hustling to perfect the finishing touches on featured houses. The Park City Area Showcase of Homes is hosted annually by the Park City Homebuilders Association and encourages people in the community to tour the best designed houses in the city from the past year. 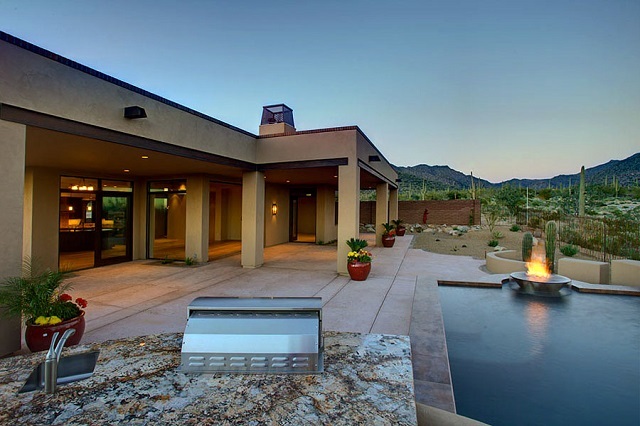 This prominent annual event provides insight into the current condition of the luxury real estate market and influences home-design trends in the entire southwest including in Tucson, Arizona. Signs of the weakened economy are still there, with fewer homes submitted for the showcase than in past years according to ParkRecord.com. Eleven homes were featured in this year’s event and of those, only one was built without an owner ready to move in. The event has dropped down to single digits in the toughest years and had approximately 20 featured homes at its peak less than five years ago. One design trend that has emerged from this show is the shift from 10,000+ square-foot luxury homes to smaller, more economic options. More homeowners are looking for quiet towns where they can still buy new and have choices and selections to customize. That’s why luxury custom-built homes are some of the most sought out homes on the Tucson luxury real estate market today. Those about to retire seek the convenience of having a home built to suit their specific needs. First time buyers and new families appreciate the quality and cost per square foot of luxury custom-built homes. And of course, investors prefer these houses for all of the reasons above. This week’s featured homes at The Residences at The Ritz-Carlton, Dove Mountain are loaded with custom upgrades and renovations to create your dream home in the Tucson luxury real estate market. The Castillo home is 4,725 square feet and includes a commanding living room with a towering fireplace. The Hacienda floor plan is 4,100 square feet and features an impressive great room and private courtyard. The Homestead home is 3,276 square feet and includes a beautiful morning room, 2 car garage, and optional pool. The Casa floor plan can be either 2,479 or 2,771 square feet. It includes spectacular views and two bedrooms. For those looking to design everything from scratch, there are exclusive custom homesites available at The Residences so you can design the luxury home of your dreams for all to admire in the Tucson luxury real estate industry. And one of the best parts of owning a home at The Residences is the added touch of world-class service provided by The Ritz-Carlton management. Let them handle the details of housekeeping, yard work and exterior maintenance while you enjoy your home as a beautiful and relaxing haven. Ownership in The Residences at Dove Mountain also brings access to The Ritz-Carlton Golf Club, with its Jack Nicklaus Signature Golf Courses, The Ritz-Carlton hotel and spa, and many other amenities of the Dove Mountain community. Visit us at our newly finished models located at 6067 W. Seven Saguaros Cir. Marana, AZ 85658 or request more information by contacting us today.